Background and objectives: Acute kidney injury (AKI) has been associated with increased mortality in a variety of clinical settings. We studied the incidence, predictors, and effect of AKI on long-term overall mortality and cardiovascular events after stroke. Design, setting, participants, & measurements: This was a prospective outcome study of 2155 patients who sustained an acute first-ever stroke and were followed for 10 yr. Patients were divided in two groups: (1) Those with an acute increase (over 48 h) in serum creatinine ≥0.3 mg/dl or a percentage increase of ≥50% and (2) those with a change <0.3 mg/dl, no change at all, or even a reduction. Results: Twenty-seven percent of patients developed AKI after acute stroke. Stroke severity, baseline estimated GFR, heart failure, and stroke subtype predict the occurrence of AKI. The probability of 10-yr mortality for patients with AKI was 75.9 and 57.7 in the patients without AKI (log rank test 45.0; P = 0.001). 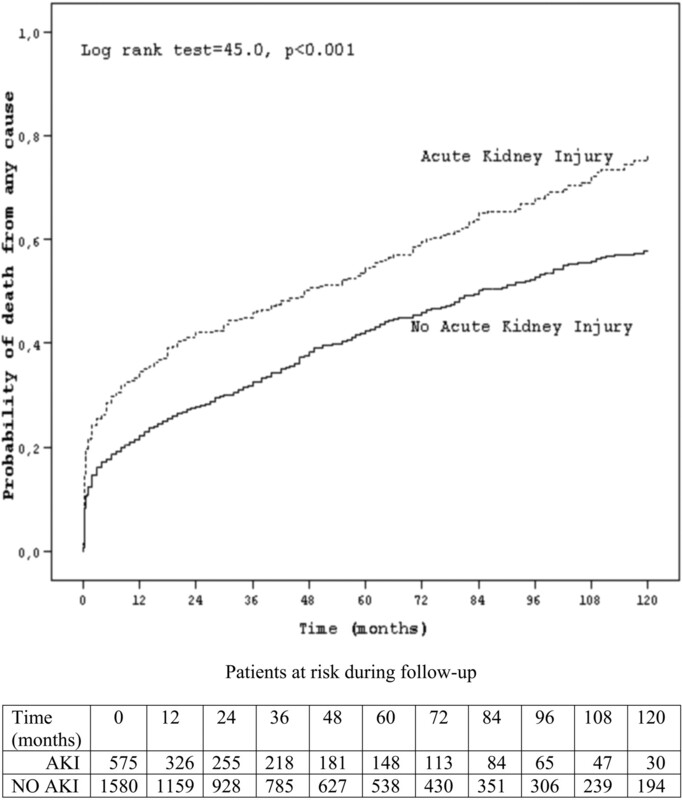 When patients with AKI were subdivided into three groups according to AKI severity, the probability of 10-yr mortality increased: 73.7, 86.5, and 89.2 in stages 1, 2, and 3, respectively. In Cox proportional hazard analysis, AKI was an independent predictor of 10-yr mortality (P < 0.01) and for the occurrence of new composite cardiovascular events (P < 0.05) after adjustment for available confounding variables. Conclusions: AKI after stroke is a powerful and independent predictor of 10-yr mortality and new composite cardiovascular events. Renal function impairment has been associated with an increased risk for all types of cardiovascular disease (CVD), including stroke (1,2). This association has been documented in both predialysis (especially when CVD and anemia are present) (3,4) and dialysis patients. Moreover, preexisting renal dysfunction in patients with acute coronary syndromes or acute stroke has been associated with an increased risk for death and cardiovascular comorbidities (5–9). So far, the majority of studies concerning the association between renal function and CVD (including stroke) have focused first on revealing the factors that relate chronic kidney disease (CKD) with CVD and second on elucidating the role of CKD as an independent prognostic factor for short- and long-term mortality and new cardiovascular events. Although the incidence of AKI has increased during the past 5 yr, it remains an underrecognized cause of CKD. The aging population of Western societies, the increase in comorbidities, and the expansion of intensive care unit capabilities will probably increase even further the occurrence of AKI in the future. This observational prospective study aimed to (1) report on the incidence and predisposing factors for AKI in patients who sustained an acute stroke and (2) determine the role and severity of AKI in long-term mortality and the occurrence of new cardiovascular events during the same period. Between January 1993 and December 2007, 2598 patients who sustained an acute first-ever stroke were admitted to our hospital, which is a university institution that provides tertiary care services to the urban population of the city of Athens. Nearly 70% of these patients were hospitalized in our acute stroke unit; the rest were admitted to the departments of clinical therapeutics and internal medicine. Patients with subarachnoid hemorrhage were transferred to a neurosurgical unit. All patients were investigated prospectively on the basis of a standard diagnostic protocol, and the data were entered into a computerized stroke data bank (10). For the purpose of this study, we selected 2155 patients who presented within 24 h from symptom onset and had renal function tests both on admission and within the first 48 h. A total of 443 patients were excluded from the study because of delay of admission (n = 251), lack of neurologic evaluation (n = 145), and missing values concerning renal function tests (n = 47). The study protocol was approved by the appropriate institutional review board and ethics committee. All patients were examined on admission by an internist specialized in stroke or a neurologist, and stroke severity was assessed using the National Institutes of Health Stroke Scale (NIHSS) score (11). An initial brain computerized tomography (CT) scan and a 12-lead electrocardiogram were immediately performed soon after admission. Stroke was defined according to World Health Organization criteria (12). Major stroke subtypes (ischemic versus hemorrhagic) were determined by brain imaging. Patients were classified into etiopathogenic ischemic stroke subtypes on the basis of TOAST criteria after extensive workup (13). Cerebral edema was defined as the presence of midline shift, sulcal effacement, or ventricular compression in patients with acute ischemic stroke (14) and as a hypodense area around the hyperdense hematoma accompanied by mass effect in patients with intracerebral hemorrhage (15). The use of antihypertensive medications before the index event as well as after (during the acute stage) was recorded. Upon admission, a standard blood sample was obtained for complete blood count, coagulation tests, serum electrolytes, glucose, and renal function tests (urea, creatinine levels). Renal function was monitored daily during hospitalization. The study patients were followed up during their hospitalization and then prospectively at months 1, 3, and 6 and yearly thereafter, up to 10 yr after stroke or until death, by a study investigator and a trained nurse. Follow-up was routinely performed in our outpatient clinic or in the patient's place of residence in cases of severe handicap. The outcome events of interest were as follows: (1) Development of AKI during hospitalization, (2) death from any cause, and (3) the composite all cardiovascular events (fatal and nonfatal). To determine recurrent vascular events and causes of death, we evaluated all of the available information obtained from death certificates, hospital records, physicians’ notes in private practice, necropsy findings, and the patients’ clinical presentation at the regular follow-up assessments. The composite cardiovascular events included recurrent stroke, new myocardial infarction, new onset of heart failure, sudden death with or without resuscitation, clinical onset of peripheral arteriopathy, and thoracic or abdominal aortic rupture (16). Recurrent stroke was defined as a cerebrovascular event of sudden onset that lasted for >24 h subsequent to the initial stroke and that clearly resulted in a new or an increase in an existing neurologic deficit (17). In our study, patient baseline creatinine was considered to be the value recorded on admission. The Acute Kidney Injury Network (AKIN) defines AKI as an abrupt (within 48h h) reduction in kidney function characterized by an absolute increase in serum creatinine of either ≥0.3 mg/dl (≥25 μmol/L) or a percentage increase of ≥50% or a reduction in urine output (documented oliguria <0.5 ml/kg per h for >6 h) (19). Patients were divided in two groups on the basis of the AKIN definition (using only the creatinine criterion): (1) Those with an acute increase (over 48 h) in serum creatinine ≥0.3 mg/dl or a percentage increase of ≥50% and (2) those with a change in serum creatinine <0.3 mg/dl, no change at all, or even a reduction. Only a small percentage (2%) of patients had documentation of renal function before admission. These patients were included in the AKI group only when the criteria for acute or chronic renal failure (defined by the AKIN group as an increase in serum creatinine to 4 mg/dl) were met. Moreover, to examine whether the severity of AKI influences the outcome of stroke, we subdivided patients with AKI into three stages (on the basis of the AKIN staging system): Stage 1, patients with an increase in serum creatinine of ≥0.3 mg/dl or increase to ≥150 to 200% from baseline; stage 2, patients with an increase in serum creatinine to >200 to 300% from baseline; and stage 3, patients with an increase in serum creatinine to >300% from baseline (or serum creatinine ≥4.0 mg/dl with an acute rise of at least 0.5 mg/dl) (19). Statistical comparisons were performed between patients with and without AKI in terms of demographic features, preexisting conditions, clinical presentation and neuroimaging, laboratory findings, and antihypertensive medication use. Categorical variables were compared with the χ2 test, and continuous variables were compared with the unpaired t test or Mann-Whitney U test as indicated. Continuous data are presented as mean (SD) and categorical data as percentages. The Kaplan-Meier product limit method and log-rank test were used to estimate the probability of mortality and the probability of the composite cardiovascular events at 1 mo, 1 yr, and 10 yr after the index event. To evaluate which factors contribute to the development of AKI, we used binomial logistic regression analysis. Associations are presented as odds ratio (OR) with their corresponding 95% confidence intervals (CI).To evaluate which factors contribute to 10-yr mortality, we used a univariate Cox proportional hazards model. Factors that were found to contribute to the outcome in the univariate analyses at P < 0.1 were included in the multivariate model. In the multivariate analyses, statistical significance was reached at P < 0.05. Associations are presented as hazards ratio (HR) with their corresponding 95% CI. SPSS 15.0 for Windows (SPSS, Chicago, IL) was used. The study cohort consisted of 2155 patients with a mean age of 70.3 ± 11.9 yr. Excluded patients had a similar profile to the study patients: Mean age 69.4 ± 11.5 versus 70.3 ± 11.9 (P = 0.14), male gender 244 (61.0%) versus 1320 (61.3%; P = 0.96), and severity assessed by the NIHSS score 9.7 ± 8.7 versus 10.2 ± 9.5 (P = 0.27). Hypertension (69.4%), smoking (30.8%), and atrial fibrillation (31.1%) were the most prevalent risk factors (Table 1). The mean value for stroke severity, assessed by the NIHSS score, was 10.2 ± 9.05. Eighty-five percent of patients sustained an ischemic stroke with the most prominent subtype cardioembolism (31%). In a low percentage of patients (11.7%), antihypertensive medications were used for BP management within the first 48 h. There were no differences in medication use between the two groups except for use of antiplatelet agents (47.3 in patients with AKI versus 57.7 in patients without AKI; P = 0.001). A total of 575 (26.7%) patients developed AKI after admission to the hospital. On the basis of the AKIN staging system, 460 (21.3%) patients were classified as stage 1, 62 (2.9%) as stage 2, and 53 (2.5%) as stage 3. Patients with AKI were older, had a higher prevalence of atrial fibrillation and heart failure, and presented with a more severe neurologic deficit than patients without AKI (Table 1). Moreover, lacunar strokes and eGFR were lower in the AKI group. The percentages of patients who developed AKI increased with the severity of baseline renal dysfunction (eGFR): 13.3, 41.2, and 81.5% for patients with eGFR ≥60, 30 to <60, and <30 ml/min, respectively. Binomial logistic regression analysis showed that NIHSS score, heart failure, stroke subtype, and baseline eGFR were independent predictors of the development of AKI (Table 2). During the follow-up period (from day 1 to 10 yr, mean 42.4 ± 40.8 mo), 996 deaths occurred. The probability of early and late mortality was significantly different among the two groups (Table 3, Figure 1). The probability of 10-yr mortality in the group with AKI was 75.9 (95% CI 70.4 to 81.4) and in group without AKI was 57.7 (95% CI 54.4 to 61.0; log rank test 45.0, P = 0.001). When patients in the group with AKI were subdivided into three groups according to the AKIN classification system, the probability of 10-yr mortality increased following the severity of AKI despite the small numbers in the groups of stages 2 and 3 and wide CIs: In stage 1, it was 73.7 (95% CI 67.8 to 79.6), in stage 2, it was 86.5 (95% CI 64.9 to 100.0), and in stage 3, it was 89.2 (95% CI 71.6 to 100.0). To sort out the relative contribution of AKI (in respect to baseline renal function) in overall mortality, we performed subsequent analyses—stratifying patients according to baseline eGFR—and examined the mortality rates between patients with and without AKI. In patients with eGFR ≥60 ml/min, crude mortality rates at 10 yr were 56.7% (95% CI 53.0 to 60.4) for patients without AKI and 69.2% (95% CI 60.2 to 78.2) for those with AKI (P = 0.023), whereas patients with an eGFR <60 ml/min had crude mortality rates of 60.6% (95% CI 54.1 to 67.1%) and 86.4% (95% CI 80.7 to 92.1; P = 0.001) for the patients without and with AKI, respectively. Cox proportional hazard analysis showed that AKI among several other factors remained an independent predictor of 10-yr mortality (Table 4). Patients with AKI had an estimated HR of 1.24 (95% CI 1.07 to 1.44; P < 0.01) after adjustment for available confounding variables. Kaplan-Meier estimates of probability of death from any cause in patients with acute stroke over a period of 10 years according to the development of AKI. During the study observation, 579 new cardiovascular events occurred: 327 recurrent strokes, 103 ischemic heart cases, 81 new cases of heart failure leading to death, 50 sudden deaths of presumed vascular origin, 10 cases of aortic aneurysm rupture, and eight new cases of symptomatic peripheral atherosclerotic arterial disease. The probability to have a composite cardiovascular event during the 10-yr period was 66.8 (95% CI 56.6 to 76.9) in the group with AKI and 52.8 (95% CI 48.5 to 56.1) in the group without AKI (log rank test 14.1, P = 0.001; Table 3, Figure 2). Using a Cox multivariate model, AKI was an independent predictor of new composite cardiovascular events at 10 yr (HR 1.22; 95% CI 1.01 to 1.48; P < 0.05). Kaplan-Meier estimates of probability of composite cardiovascular events in patients with acute stroke over a period of 10 years according to the development of AKI. In this prospective cohort study, we found that AKI is a common complication after acute stroke. More than one fourth of our patients developed AKI in the first 2 d after the ictus. We demonstrate that AKI is an independent predictor of both early and long-term mortality after acute stroke, after adjusting for CKD and other factors. Only a recent retrospective study investigated the incidence and characteristics of AKI in patients with stroke in an Eastern European population and its role on short-term mortality (20). The authors reported a 14.5% incidence of AKI that was associated with an increased 30-d mortality (43.1 versus 12.8% in patients without AKI). No data were provided concerning the role of several important factors that contribute significantly to the pathogenesis and physical history of stroke, such as stroke severity, hypertension, atrial fibrillation, type of ischemic stroke, imaging studies data, and antihypertensive medication use. Moreover, patient survival was assessed only in the short term (30 d), and no data were available for the occurrence of new cardiovascular events. Our findings not only reinforce the results of this previous study but also provide additional data on predicting factors (we identified two additional independent predictors for AKI: Stroke severity as assessed by the NIHSS score and etiopathogenic stroke subtype). Moreover, our study is the first one of stroke patients using the refined AKIN criteria for the definition and classification of AKI. According to our results, AKI is not a rare finding after acute stroke; on the contrary, in our cohort, 26.7% of patients developed AKI. The high incidence of AKI in our population can be explained by the increased age (mean age 70.3 ± 11.9 yr), low baseline GFR, and the use of a high-sensitivity definition for the detection of AKI. Preexisting renal dysfunction may be a major contributor to the occurrence of AKI. In our study, only 13.4% of patients with an eGFR >60 ml/min developed AKI, whereas the percentages for patients with an eGFR of 30 to 60 and <30 ml/min were 41.2 and 81.0%, respectively. For patients who were hospitalized with acute myocardial infarction or heart failure, the reported incidence ranged from 12 to 27% (21–24). Heart disease and stroke share similar risk factors, and despite that stroke is a more heterogeneous disease regarding etiology, the incidence of AKI seems comparable. The most important novel finding of our study was that AKI proved to be an independent prognostic factor for long-term (10-yr) mortality. After adjustments for covariates, patients with AKI had a 24% higher probability of death up to 10 yr compared with patients who did not develop AKI. Even when patients with AKI were classified into three groups according to the AKIN classification system for the severity of AKI, mortality rates increased in parallel with the severity of AKI: 73.7% in stage 1, 86.5% in stage 2, and 89.2% in stage 3 as compared with 57.7% in the group without AKI. Parikh et al. (21) reported similar results to ours in a large old cohort of the Cooperative Cardiovascular Project; crude mortality rates were 68.3% for patients without AKI, 78.9% for mild AKI, 87.8% for moderate AKI, and 93.5% for severe AKI. We demonstrate that the survival Kaplan-Meier curve for patients with AKI separates early by the first month after the ictus, a finding also observed by Covic et al. (20). Because of the small numbers of patients with stages 2 and 3 AKI, we did not force into the Cox multivariate model the AKIN classification. Despite this limitation, the results indicate that even a small increase in creatinine level early after stroke is associated with a worse early and late outcome. The baseline renal function as assessed by the eGFR remains a significant predictor in both study outcomes (overall mortality and cardiovascular events). It is difficult to sort out the relative contributions of each one of the two parameters (baseline eGFR and AKI) in predicting late stroke outcomes because they have a confounding effect in overall long-term mortality after stroke. Nevertheless, in the multivariate Cox regression analysis, AKI remains an independent predictor of 10-yr mortality even after adjustment for baseline eGFR (calculated from the MDRD study equation using the cutoffs of <30, 30 to 60, and >60 ml/min). There is growing evidence in medical literature of the kidney's role in the development of cardiovascular disease, including stroke. A novel finding in our study is that patients with AKI experienced more vascular events (recurrent stroke, myocardial infarction, heart failure, and vascular death) during the follow-up period. The increased vascular comorbidities may explain only in part the increased overall mortality in patients who develop AKI in the acute phase of stroke. Although the majority of our patients had mild AKI that in most cases was “clinically” reversible, it should be emphasized that in the tissue level, this does not always hold true. Endothelial damage, tubular inflammation, and activation of intrarenal fibrotic pathways during kidney repair may gradually damage kidney structure, leading to proteinuria, hypertension, and progressive decline in renal function (25–27). Unfortunately, we do not have long-term data concerning renal function to support this hypothesis. Our findings highlight the importance of two neglected (until now) parameters: First, patients with stroke should be evaluated on admission for the probability of developing AKI, on the basis of the presence of the factors that were found in our study to predict independently its development. We used a relatively sensitive definition for the diagnosis of AKI to emphasize the need for early recognition of kidney injury to all physicians who treat patients with stroke. Intensive monitoring (ideally in stroke units), avoidance of all potential nephrotoxic insults, adequate hydration, management of BP, and restoration of any electrolyte and acid-base disturbances could potentially prevent the development of AKI in this setting. Second, patients who eventually develop AKI should be followed in the long term more closely to avoid the potential deleterious consequences of kidney disease. Our study has several limitations. First, the study is a hospital- and not a population-based study, and patients who had had a stroke and were treated at home are not included. Second, renal function was assessed only during hospitalization; therefore, we can provide information on neither the role of the duration of renal dysfunction (after discharge) on the mortality risk and vascular events nor the percentage of AKI on patients who recovered, the percentage who developed CKD, and those who required dialysis. Third, because only 2% of the sample had documentation of renal function before admission, it is unclear to what extent the first creatinine reflects “baseline” kidney function. Fourth, the number of patients in stages 2 and 3 AKI groups is too small to determine the role of severity of AKI on long-term outcomes. Finally, patients with AKI (and CKD) had more CVD at baseline and by virtue of this are at greater risk for future events. A novel independent prognostic factor for long-term survival and for the occurrence of composite cardiovascular events after stroke is introduced: AKI. This finding suggests that AKI should be added to the other known prognostic factors and emphasizes the importance of early identification and management of unrecognized AKI in stroke therapy.